Biotinylated Human CD30 / TNFRSF8, His Tag (CD0-H82E6) is expressed from human 293 cells (HEK293). It contains AA Phe 19 - Lys 379 (Accession # NP_001234.2). The protein has a calculated MW of 41.1 kDa. The protein migrates as 60-100 kDa under reducing (R) condition (SDS-PAGE) due to glycosylation. 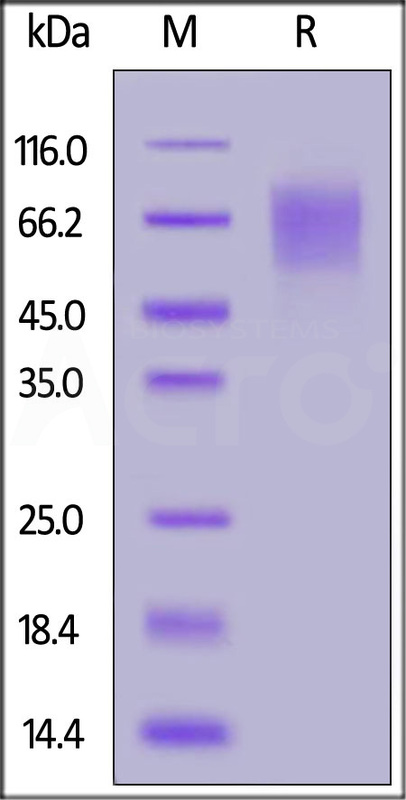 Biotinylated Human CD30 / TNFRSF8, His Tag on SDS-PAGE under reducing (R) condition. The gel was stained overnight with Coomassie Blue. The purity of the protein is greater than 95%. 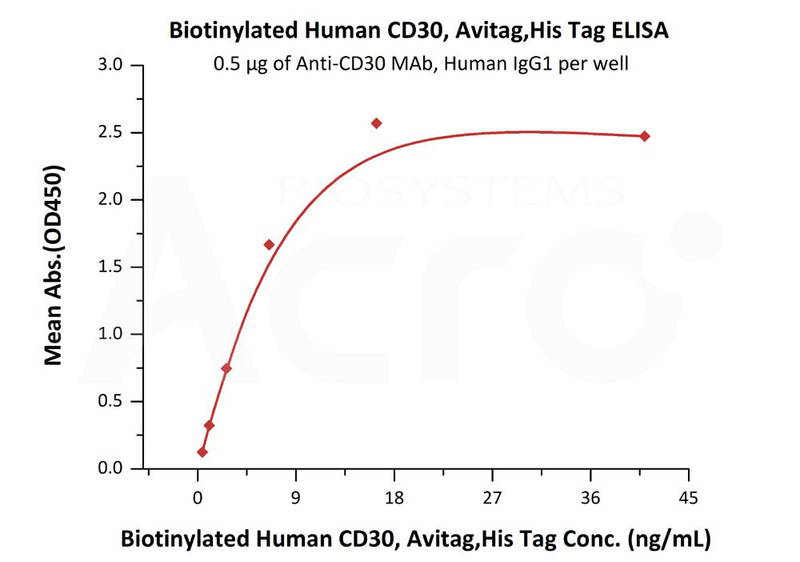 Immobilized Anti-CD30 MAb, Human IgG1 at 5 μg/mL (100 μL/well) can bind Biotinylated Human CD30, His Tag (Cat. No. CD0-H82E6) with a linear range of 0.4-6.5 ng/mL (Routinely tested). Immobilized Human CD30 Ligand, Mouse IgG2a Fc Tag, low endotoxin (Cat. No. 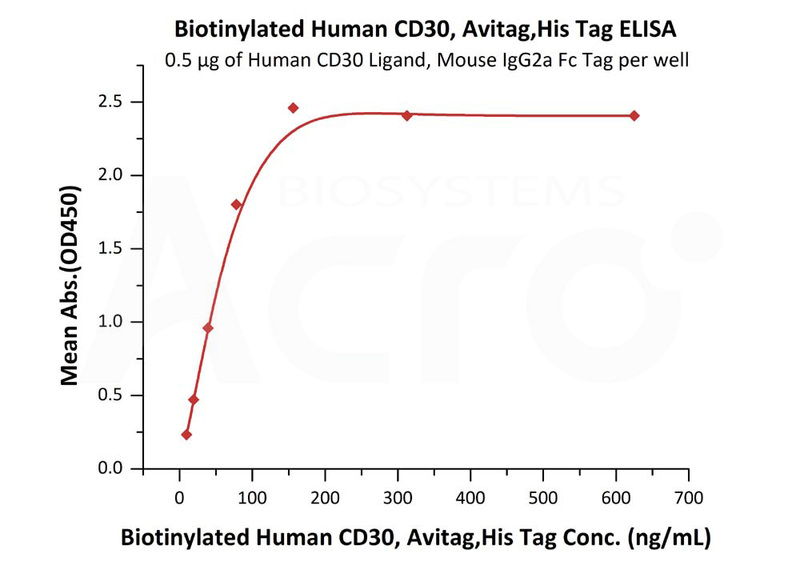 CDL-H525b) at 5 μg/mL (100 μL/well) can bind Biotinylated Human CD30, His Tag (Cat. No. CD0-H82E6) with a linear range of 10-78 ng/mL (QC tested). Human CD30 is also known as TNFRSF8, is a cell membrane protein of the tumor necrosis factor receptor family and tumor marker. TNFRSF-8 is expressed by activated, but not by resting, T and B cells. Also, CD30 is expressed on classical Hodgkin Lymphoma cells together with CD15. CD30 is the receptor for TNFSF8/CD30L. CD30 can interact with TRAF2 and TRAF5, and mediate the signal transduction that leads to the activation of NF-kappa-B. TNFRSF8 may play a role in the regulation of cellular growth and transformation of activated lymphoblasts. TNFRSF8 is a positive regulator of apoptosis, and also has been shown to limit the proliferative potential of autoreactive CD8 effector T cells and protect the body against autoimmunity. (1) Gorczyca W., et al., 2003, Int. J. Oncol. 22 (2): 319–24. (2) Aizawa S., et al., 1997, J. Biol. Chem. 272 (4): 2042–5. (3) Ansieau S., 1996, Proc. Natl. Acad. Sci. U.S.A. 93 (24): 14053–8. (4) Lee S.Y., et al., 1996, J. Exp. Med. 183:669-674.